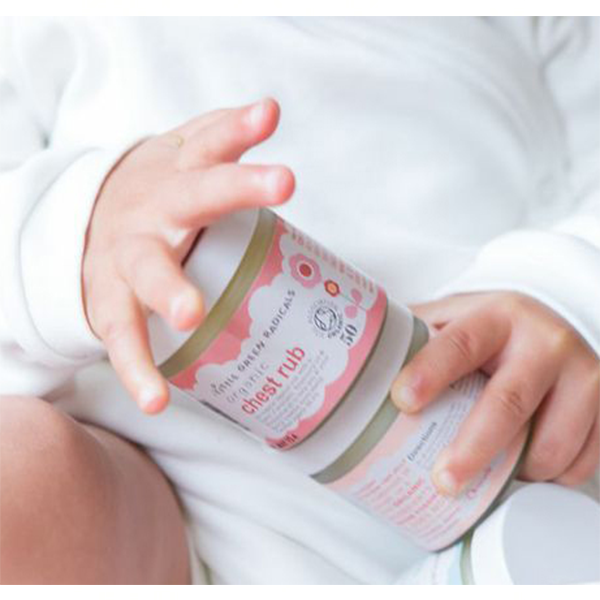 Little Green Radicals Chest Rub is 100% natural and specially formulated with a blend of lavender oil to relax and settle and aromatic rosemary oil and stimulating eucalyptus oil to help clear congestion and help you and your family breathe more easily. Hand made in Dorset, Little Green Radicals Chest Rub is Soil Association certified and not tested on animals. Warm a small amount between your fingers, then apply sparingly to the upper chest and back. Especially beneficial for night time use. For external use only, avoid contact with eyes. If irritation occurs, discontinue use. My 10 month old has had a cough on and off all winter. I did not want to go down the Vicks route as I am not keen on the ingredients used in it. This rub smells very similar to Vics (just not as strong) thanks to the eucalyptus oil but knowing that it is as natural as it can possibly be made me more at ease putting it on my boy's soft skin. I used in on both his chest and back and also on his feet. It seems to be helping and his cold symptoms are reducing. It's hard to tell if it was thanks to the product but it certainly did not do any harm and I believe that all the essential oils made it easier to breathe for him. I would definitely recommend this rub over Vics (or similar) - at least due to its natural properties.